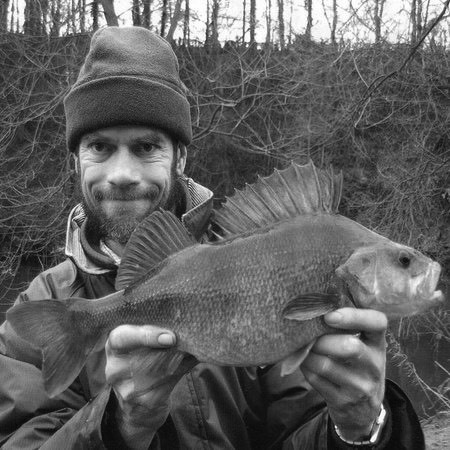 Dave Tipping, is a true all-rounder, best known for his evocative writing on specimen-sized coarse fish, he is equally passionate about sea angling and has also been known to dabble with a fly rod. He also enjoys the challenge of seeking unusual mini-species in rock pools, or Arctic char in remote upland tarns, just as much as the pursuit of monster tench, barbel and pike. He began fishing at the age of eight on a tumbling Yorkshire beck, home to wild brown trout, but his fascination with the wider natural world soon saw him looking further afield, and ultimately seeking rare fish from across the UK and Ireland. His lifetime tally extends to over eighty species (and rising), ranging from a diminutive common goby to a barn door-sized skate, and includes such oddities as black-mouthed dogfish, powan, Couch’s sea bream, tadpole fish and viviparous blenny. A regular contributor to the angling press for over forty years, he is the author of three books, the co-author of another, and has written chapters for several more. He is a genial character in everyday life, but has sometimes courted controversy in print. In particular, his steadfast refusal to accept that otters are a threat to angling, or that anglers should be given leeway to control their numbers, has enraged some within the sport. He has also been a fierce critic of modern fishery management practices, arguing that they lean too heavily on selectively-bred, introduced species (principally carp) and not heavily enough on conservation and habitat improvement. Unusual in this day and age, he has never been tempted by sponsorship, believing it taints an author’s work and restricts his freedom to express an impartial view. He began his working life as an art teacher, tempted by the prospect of six weeks’ holiday (fishing) every summer, but is now a long-standing shareholder in a large Harrogate taxi company. Outside angling, he enjoys videoing and photographing wildlife and is a former President of the Harrogate and District Naturalists’ Society. He lives with his wife, Janet, and three very spoilt rescue cats. Sticklebacks to Skate was published in 2016.